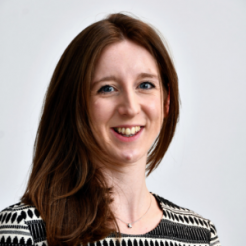 Laura Holland is Director of Communications at the Rosalind Franklin Institute. She has been with the organisation since its conception. Prior to this, she was Engagement Manager at Diamond Light Source for eleven years, where she led public engagement and postgraduate engagement programmes. Laura holds a BSc in Cell Biology from the University of Durham. She also holds a Research Masters in Medical and Molecular Bioscience, from the University of Newcastle upon Tyne, and a PGDip in Science Communication from The University of the West of England, which she completed alongside her work at the Diamond Light Source.